Digital marketers today constantly strive to understand their users better. Instead of sending bulk campaigns to the entire user base and hoping for the best conversion, they use data to personalize campaigns. And carpet bombing has given way to targeted marketing. Meanwhile, the attention span of a user is at an all-time low. From 15 seconds in 2000, it’s now generally accepted to be 8 seconds. People have no patience for notifications that are irrelevant. To send highly contextual and relevant communication to your users means having a good segmentation strategy. Without segmentation, you are hitting your entire user base with a one-size-fits-all campaign that will fail due to irrelevance. E.g., Event in Boston? Don’t send the campaign to users in San Francisco! Marketers are well aware of the power of segmentation for improving relevance and optimizing costs. There are multiple segmentation strategies to reach out to users. They include grouping users by demographics, geographics, behavior, psychographics, etc. All of these segmentation strategies are based on the past information available on the users. But what if there was a way to segment users based on the actions they are going to perform in the near future? For example, what if a marketer already knew which users had a higher propensity to churn, before they actually churned? Such information would be powerful, but only if you use it to create powerful long-term strategies that stop them from churning and improve overall business performance. CleverTap provides marketers with both those predictive insights on potential user behavior as well as the capability to take action on these insights. Marketers now have the capability to shift their engagement strategy from traditional, rule-based marketing to a far superior goal-based marketing, which provides a window into the near future behavior of users. Here is how goal-based marketing strategies are created on CleverTap. This will give you a metric against which to measure your KPI. Let’s say at the fictitious company Apppp, growth marketer John wants to know the number of users who will uninstall in the next 15 days. By creating a goal of App Uninstalls, he figures out that he will likely see 100,000 app uninstalls in the next 15 days. Once you define your goal or target, the next step is to understand who falls under each Intent Segment. With our Apppp example, John wants to know: out of the 100K uninstalls, who are most likely to uninstall, moderately likely to uninstall, and least likely to uninstall? This information will be vital when targeting users based on their intent. Our Coeus Data Science Engine predicts those users based on their likelihood to perform the event and places them into 3 intent buckets: Most Likely, Moderately Likely, and Least Likely. Given that you’ve now aligned your business goal on CleverTap and bucketed users with their likelihood of meeting the Goal, the next step is to take appropriate action. In Apppp, John sees that out of the 100K potential uninstalls, 30K are in the most likely bucket to uninstall. He now knows these are the customers most at risk and he must minimize app uninstalls from this group. While short-term or one-off campaigns are a great way to gain spikes in your click through rates, they do not help you with your mid- to long-term business KPIs. For example if your business goal for the quarter is to convert all your at risk customers into loyal customers, one campaign will not suffice. For these objectives, CleverTap allows you to build omnichannel campaigns via Journeys. Journeys provides a way for marketers to account for all possible user actions at every stage and adapt your engagement strategy accordingly. Back to Apppp. For the 130K users who are most likely to uninstall Apppp, John needs to ensure they do not uninstall, and then make sure they move away from being at risk of churn. Sending an In-App Notification with a 20% coupon to entice them to make a purchase. Upon purchase, he sends a Thank You note with a coupon for the next purchase. 1. He can reduce the app uninstalls by hyper targeting only At Risk customers. 3. He has the potential to convert these users into loyal users by sending them further deals. 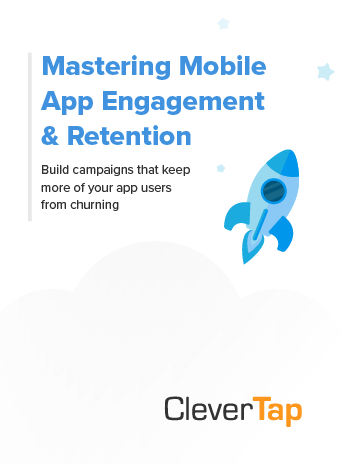 CleverTap constantly strives to ensure that Marketers have an opportunity to ensure all the discovery and analytics leads to actionable engagement opportunities. 1. Predict results for any time-bound business goal and take the necessary steps to win. 2. Identify micro-segments that you can actually influence, instead of spamming a broad database of users. 3. Create Journeys with highly relevant messaging, creatives, offers, and pricing options. 4. Save money on promotions and discounts to customers who would have purchased anyway. 5. More accurately predict marketing campaign ROI and transform your marketing team from a cost center to a revenue center. For more information about engagement, segmentation, and intelligent mobile marketing, check out our white papers, webinars, and case studies. Explore the various lifecycle stages of a mobile app user and learn engagement (and re-engagement) strategies via push notifications, deep linking, in-app messaging, and more.